From Reykjavik, drive Hwy. 1, the road that circles around all of Iceland, south-east. The distance from the center of Reykjavik is 328 kilometer. You will see the mountain from the road across a large, flat area, quite some time before arriving. The trailhead is at the end of a short side road going left, there is a sign at this exit saying Sandfell. The location of the trailhead and parking is at N63.94462, W016.79299, with an elevation of about 100 meter. From the parking area, the trail heads left if you face the closest hillside. The trail becomes quite distinct and clear very soon. It climbs the hillside, sometimes with a few zig-zag turns. It is never steep and always good to walk/hike. Higher up, as it crosses off the main hillside, the trail touches a nice stream where one should drink/catch some water for the remainder of the trip. Next, the trail climbs along a ridgeline, eventually and slightly steeper, gaining what has been the horizon for some time, a rocky buttress, the trail is still very easy to follow. 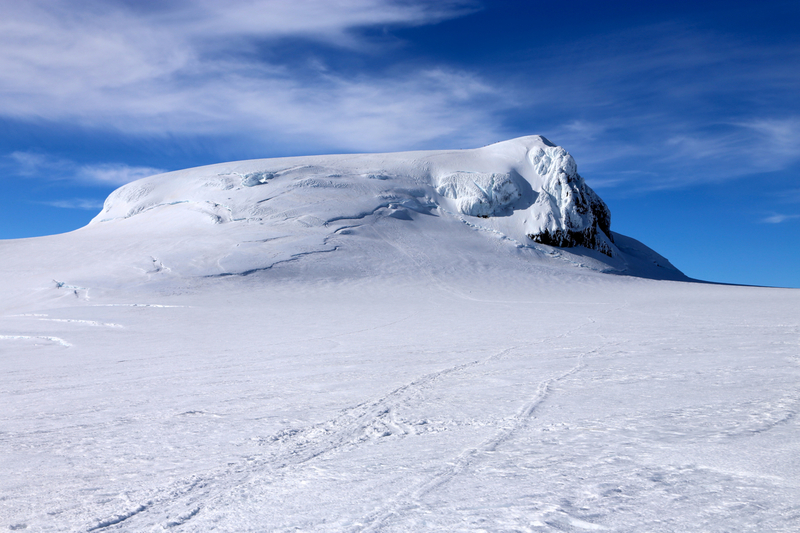 Above here, the terrain is much less steep as one now gets closer to the lower parts of the glacier. Depending on the time of year and on the amount of snow in the last winter, one will find snow and can start skiing in this vicinity. 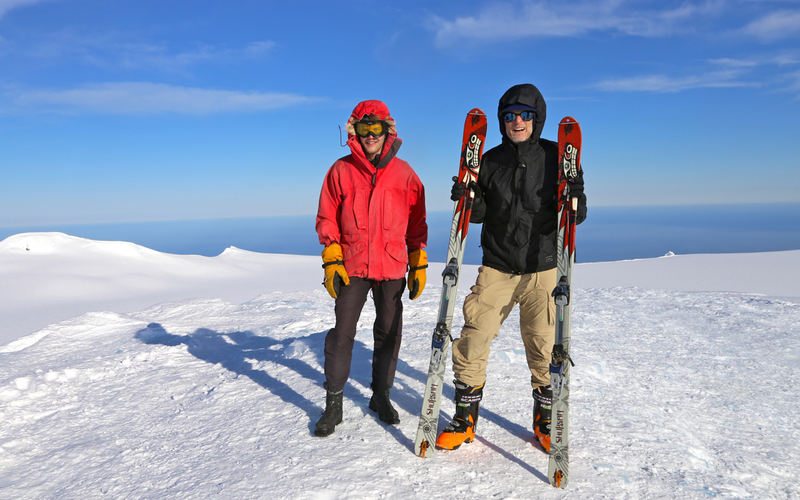 We started skiing at location, N63.96010, W016.75714, elevation about 775 meter. Next, the route proceeds uphill and crosses a horizon ridge that appears to be left when seen from below. Above here, one will finally enter the lower part of the glacier. The next part of the route, up the lower glacier, is a broad, large slope with a very easy angle. Note that this is a glacier and there are crevasses. Some may be visible while others are hidden under snow, caution is definitely needed. This long uphill finally tops out at location N63.98877, W016.68477, elevation near 1800 meter. There is normally a somewhat larger crevasse running perpendicular to the direction of travel, in this area where the glacier breaks across this edge. 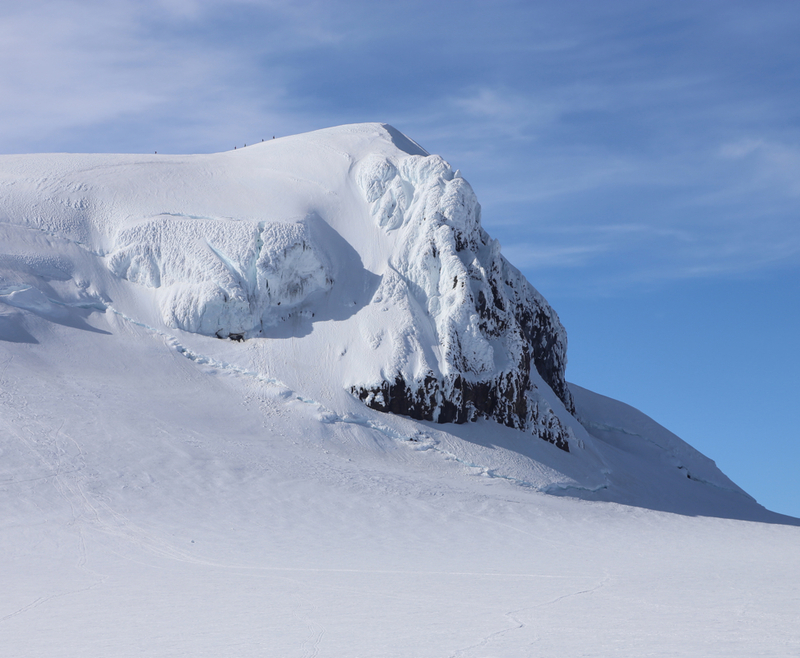 The peak itself becomes visible, a pretty flat and good size plateau must be crossed to get to its base. Finally, one ascends a slope that steepens up to another crevasse that runs across, above this one continues uphill on a more gentle slope heading towards some seracs. Next, turn right and follow the easiest slope uphill with a final turn more left to approach the main crest. 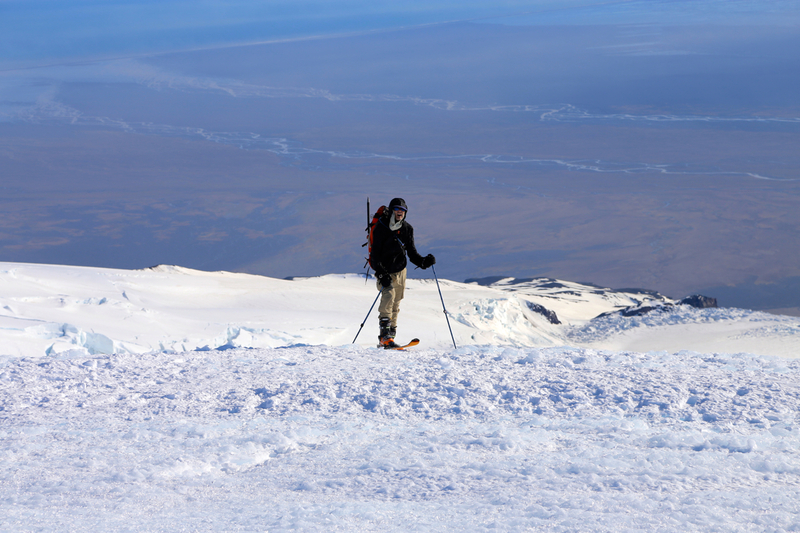 All that remains is to ski on easy terrain to the final summit hump, ascend this and celebrate the top of Iceland. A long weekend in May, we decided to visit Iceland for the first time. I had been to Iceland 6 times before, but each time only staying one night in tranist to or from East Greenland. My son Pål Jørgen wanted to come along as well as my friend Greg Slayden from Seattle. Pål and I flew in early Saturday morning on May 14th. while Greg would arrive on Sunday morning. Our first priority summit was the Iceland HP, Hvannadalshnukur. We picked up Greg as planned, except that it took a full hour for him to clear out of the airport. We told him that the weather looked good in the very beginning of our week long trip and that the Iceland HP therfore would be our first goal. "Tomorrow?" asked Greg, "Today!" was our immediate reply. Without further delays, we therefore drove to the trailhead, arriving there a bit after noon. We all realized that this would be a tough day for Greg, non-stop Seattle to Hvannadalshnukur. People generally start this climb very early in the morning and a few concerned visitors asked if we really intended to start this late. My reply would be that since it would not get dark, this really did not matter a whole lot. I expected that we would be back down by midnight - at the latest. 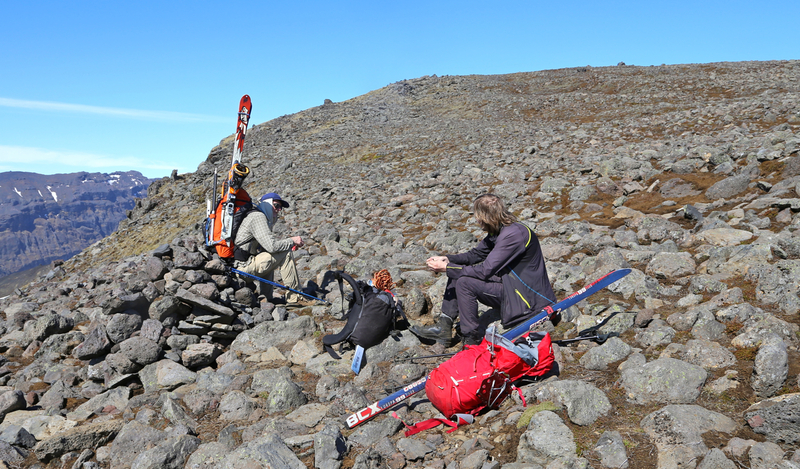 We got going at 1245, quite a long hike along a nice trail before we could put our skis on around 1420. The broad hill climbing about 1000 vertical meter, seemed to never end, but we finally reached the flat plateau around 1700. 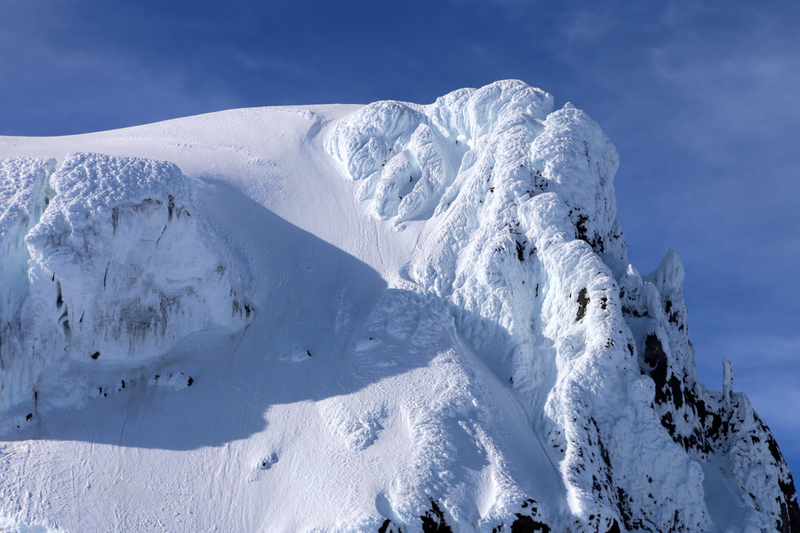 Nice to finally see the mountain with impressive ice formations just below the summit. From here, the remaining climb was quite easy and we arrived at the summit at 1830. 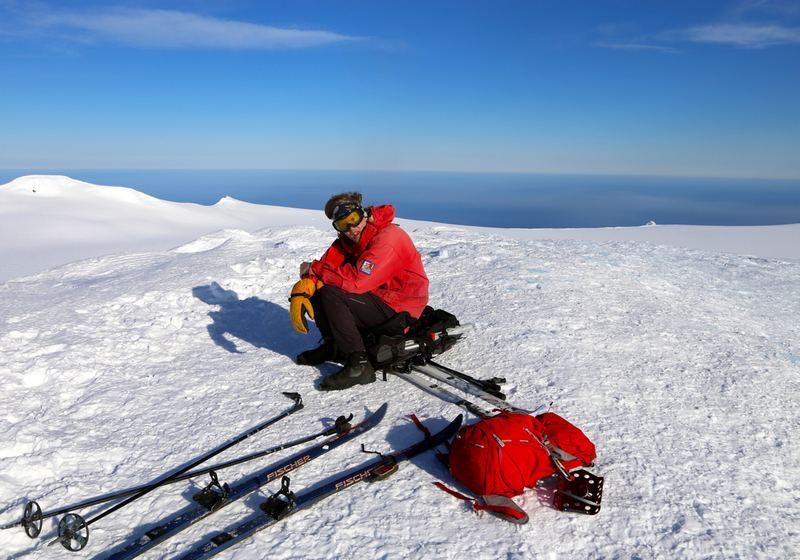 Greg slowed down with his randonnee skis when crossing the plateau, however Pål Jørgen needed a small supply of food around the same time, so everything worked out very nicely. The steeper section of the final climb involved skiing around a small corner in order to cross a pretty horizontal crevasse. Care was needed here, but there was no real difficulty. Just keep in mind that this section needed slow skiing when descending. The final summit hump had very icy snow, difficult to ski, but short enough that we basically side-stepped going both up and down. Pål and I arrived slightly ahead of Greg, but soon enough we could all celebrate a very successful ascent, our most important goal obtained on our first day in Iceland. The view was nice and the weather stayed good. 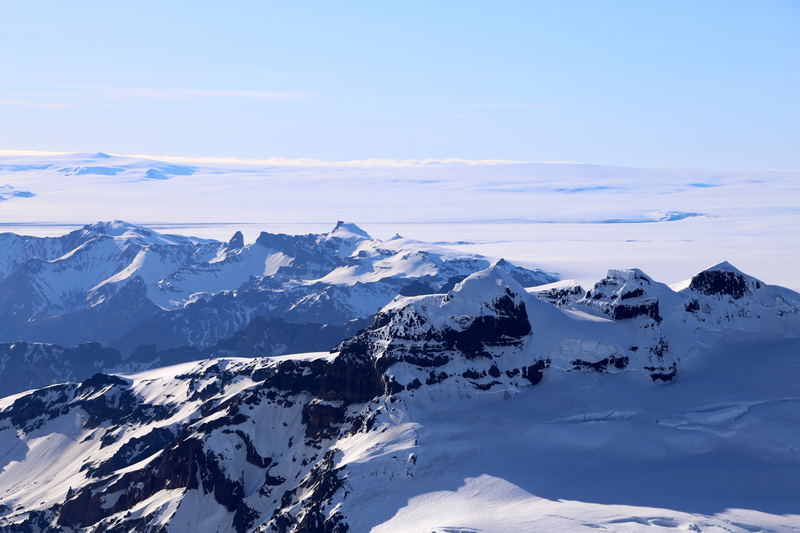 This summit is directly connected to Vatnajøkul, the largest glacier on Iceland and much bigger than any glacier in Europe. A slight breeze did not encourage an extended summit stay, we headed back down around 1900. Skiing back down was pretty straightforward, we waited for Greg at the end of the plateau. Subsequently, he and Pål waited for me as I skied a bit slower down the big hill with my quite narrow mountaineering skis. A single, minor incident, I skied my right ski directly into a small crevasse, it was completely covered, but I should have guessed its presence. I immediately fell over onto safe ground and blamed myself a bit for not being a bit more alert. This crevasse was fairly far downslope and happened to have the same direction as I was skiing, sort of diagonally downsloping. We next changed back into walking mode and arrived back down at our car at 2215. It had been a very nice climb indeed. Lots of credit to Greg for doing this peak non-stop from his home in Seattle. We pitched our tents and stayed overnight at the trailhead. 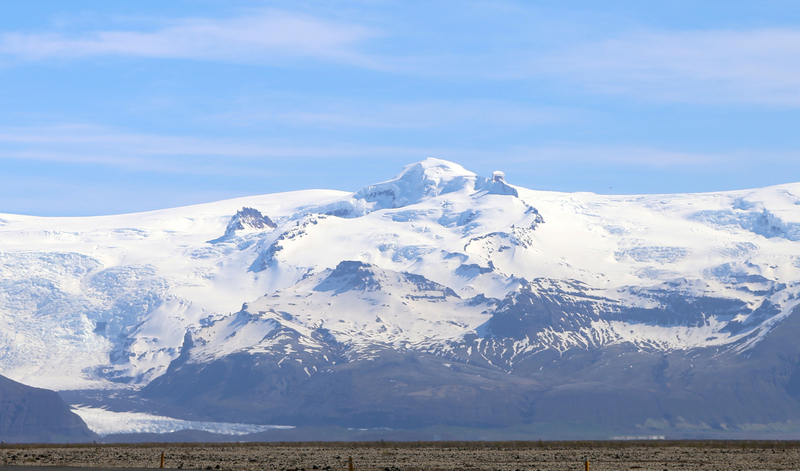 Here is a quick summary of peaks climbed in our trip to Iceland. Hvannadalshnukur as seen from Hwy. 1.